Amid soaring tensions over the Ukraine crisis, Russians have grown increasingly leery of the intentions and capabilities of the United States, according to the results of a survey released by independent pollster the Levada Center on Tuesday. According to the poll, which was conducted in April among 1,600 adults across the country, 59 percent of Russians believe that America poses a threat to their country. This figure represents a 12 percent increase since the same question was presented to respondents in 2007. 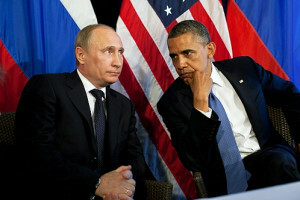 Asked about the nature of the threat posed by the United States to Russia, 48 percent of respondents voiced concern that the United States could hinder Russia’s efforts on the path toward further development, 40 percent feared the United States taking control of the Russian economy and 36 percent were wary of the unnecessary imposition of U.S. values and ideals. Nearly one-third of Russians – 31 percent – fear U.S. military intervention and occupation, a 10 percent increase since 2007, while 24 percent feared the United States would assert control over Russia’s political course. “Lately we can see that all the measures are directed at the consolidation of [Russians’] national identity. And depicting the United States as the enemy has become one of the structural elements for social consolidation,” Karina Pipiya, sociologist at the Levada Center, was quoted by Izvestia newspaper as saying. When asked about a hypothetical military conflict between the United States and Russia, 52 percent of the population said that no one would end up being a winner in that scenario. Still, 33 percent of respondents expressed certainty that Russia would emerge the victor should such a conflict materialize. The number of respondents who opined that the United States does not pose a threat to Russia plunged from 42 percent in 2007 to 32 percent now. The poll’s margin of error was no greater than 3.4 percent, according to the Levada Center.